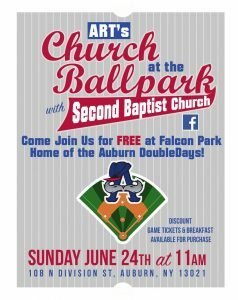 We will be moving our regular morning service from 10 am at the church to 11 am at Falcon Park (N. Division Street, Auburn). Admission to the park for the church service is FREE!!! Following the service, a pancake and sausage breakfast is available for purchase from New Hope Mills and discount tickets will be available for the DoubleDays’ game against the West Virginia Black Bears. We hope to see you there! Check out the event on our Facebook page.